The annual SSAA Program Symposium took place in Washington, DC from February 22-23 and drew participants from around the country. Individual grant recipients and center directors from the three divisions of the program (High Energy Density Physics, Low Energy Nuclear Science, and Materials Properties Under Extreme Conditions) gave updates on center or group activities and progress. The symposium was opened with a welcome address from Chris Deeney, the Assistant Deputy Administrator for Stockpile Stewardship. Donald Cook, the NNSA's Deputy Administrator for Defense Programs, gave the keynote talk before the poster session. CDAC students and partners were joined by two HPCAT scientists and presented 20 posters during the poster session on the first night of the symposium. CDAC Director Russell Hemley provided an overview of the program in his invited talk. 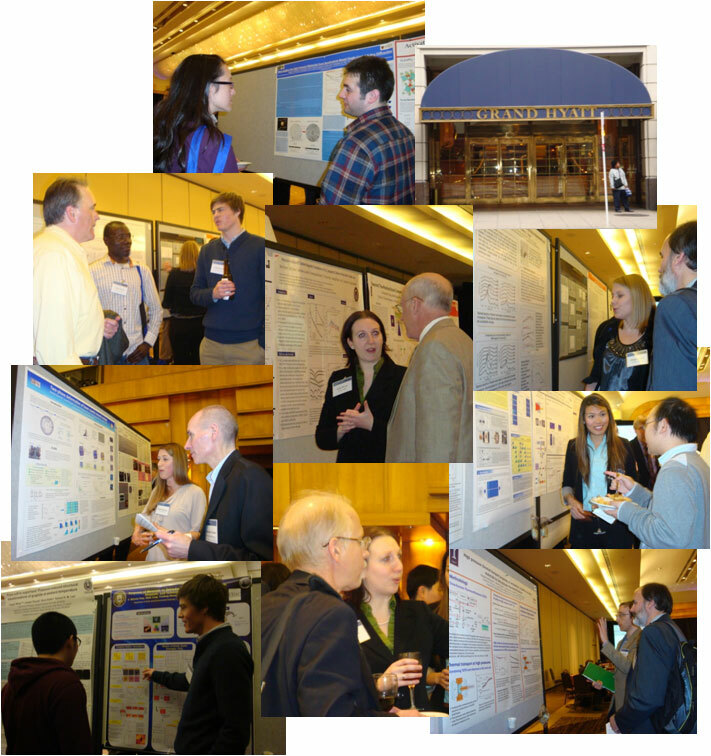 CDAC Students Chris Berg (Illinois) and Pamela Kaercher (Berkeley) both won Best Poster awards at the Symposium. Brown, K. E. and W. Shaw, Optimizing laser-driven flyer plates for studying time-resolved emission of shocked materials, 2012 Stewardship Science Academic Alliances Program Symposium (Washington, DC, February 22-23, 2012). Dunton, M., Structural transitions in silica and ligand capped silica nanoparticles under pressurse, 2012 Stewardship Science Academic Alliances Program Symposium (Washington, DC, February 22-23, 2012). Finkelstein, G., New insights into high-pressure materials from synchrotron-based single-crystal x-ray diffraction, 2012 Stewardship Science Academic Alliances Program Symposium (Washington, DC, February 22-23, 2012). Hohensee, G., High pressure thermal conductivity measurements of amorphous, crystalline, and alloy materials, 2012 Stewardship Science Academic Alliances Program Symposium (Washington, DC, February 22-23, 2012). Hrubiak, R., Equations of state of group IVB transition metals (Ti, Zr, Hf) at high temperatures and pressures, 2012 Stewardship Science Academic Alliances Program Symposium (Washington, DC, February 22-23, 2012). Kanitpanyacharoen, W., Preferred orientation and phase transformation of zirconium under high pressure and temperature, 2012 Stewardship Science Academic Alliances Program Symposium (Washington, DC, February 22-23, 2012). Kavner, A., Fiber reinforced coposites under pressure: A case study in non-hydrostaticbehavior in the diamond anvil cell, 2012 Stewardship Science Academic Alliances Program Symposium (Washington, DC, February 22-23, 2012). Lim, J., Studies of magnetism and superconductivity under extreme pressure, 2012 Stewardship Science Academic Alliances Program Symposium (Washington, DC, February 22-23, 2012). Liu, J., Tandem magnetic transition in compressed Fe7C3, 2012 Stewardship Science Academic Alliances Program Symposium (Washington, DC, February 22-23, 2012). Liu, J., Elasticity of iron alloys in Earth's inner core, 2012 Stewardship Science Academic Alliances Program Symposium (Washington, DC, February 22-23, 2012). Lu, C., Elasticity of single-crystal pyrpe under high pressure-temperature conditions, 2012 Stewardship Science Academic Alliances Program Symposium (Washington, DC, February 22-23, 2012). Mauger, Y., Polaron hopping in LiFePO4 at elevated pressures and temperatures, 2012 Stewardship Science Academic Alliances Program Symposium (Washington, DC, February 22-23, 2012). Meng, Y., Synchrotron XRD capabilities for research under extreme conditions at HPCAT, 2012 Stewardship Science Academic Alliances Program Symposium (Washington, DC, February 22-23, 2012). Pray, J. M., Behavior of actinide-bearing materials under extreme conditions, 2012 Stewardship Science Academic Alliances Program Symposium (Washington, DC, February 22-23, 2012). Uhoya, W., Simultaneous measurement of pressure evolution of crystal structure and superconductivity in FeSe0.92 using designer diamonds, 2012 Stewardship Science Academic Alliances Program Symposium (Washington, DC, February 22-23, 2012). Wang, Y., Crystal structure of graphite under room-temperature conpression and decompression, 2012 Stewardship Science Academic Alliances Program Symposium (Washington, DC, February 22-23, 2012). Xia, Y., 16-ID-D high pressure spectroscopy at HPCAT, 2012 Stewardship Science Academic Alliances Program Symposium (Washington, DC, February 22-23, 2012). Yang, J., Vibrational and elastic properties of ferromagnesite across the electronic spin pairing tansition of iron, 2012 Stewardship Science Academic Alliances Program Symposium (Washington, DC, February 22-23, 2012).